Lead is a naturally occurring heavy metal often used in the manufacturing of common industrial and building materials. It is a soft, malleable metal known for its high resistance to chemical corrosion. Additionally, buildings built prior to the 1980’s may contain lead-based paints and plumbing. Lead can be found in many forms both inside homes or places of business, as well as in water, soil and the air we breathe. In homes and workplaces: lead-based paints and plumbing in older buildings. In transportation: It is often used in the transport and storage of a wide variety of chemicals. In products: lead sheets, chemical liners, batteries, and cable sheathing. What are the risks of lead? Lead exposure can occur through accidental ingestion through the lead in water or in solid form (for example paint chips), or through inhalation of airborne particulates of lead. It can cause damage to the nervous system and brain and is often a cause of impairment to both hearing and speech. While lead can be dangerous to all parties exposed, it is especially concerning to children and pregnant women. Lead exposure has the potential to stunt growth and development as well as play a role in learning and behavioural problems in young children. What can I do to reduce the risks associated with lead? The best way to be certain if a building is lead-free is to test for it. 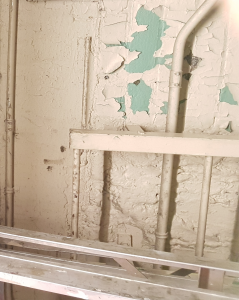 Using a portable X-ray fluorescence analyzer (XRF), T. Harris Environmental can quickly and accurately determine the presence of leaded paint, even in areas with multiple paint layers. T. Harris Environmental Management Inc.was the first consulting firm in Canada to acquire and be licensed to use a portable XRF for lead determination. We continue to be on the leading edge of techniques for identification and testing of lead-containing paint.